Flat sandwich: Take a rectangular sheet of parchment paper of the required measurement and place your sandwich in the center. Bring the top and bottom of the sheet together over the center of the sandwich and line them up. Fold down the edges by half inch and crease sharply each time until the fold is flush with sandwich surface. The right and left side of the sandwich will look like flattened tubes. Press the opposing edges of the tube into the center forming a pleated triangle. Press down and crease the edges of triangle including at the base of sandwich before folding it underneath. Repeat the process on the other side too. This way the whole thing will be nicely secured, it will look just like wrapping a present without using any tape or ribbon. Subs and wraps: These are long sandwiches and wrapping them can be quite tricky as the measurement of paper will depend on the size of sandwich. The thumb rule is to cut a piece of parchment sheet about one and a half times the length of sub or wrap. For wrapping, set the parchment paper vertically and place the sandwich diagonally over one of the corners. Lift the corner up and over the sandwich pressing it with flush and roll it towards the far opposite corner folding in the sides. After the sandwich is completely rolled in the paper and everything is tucked in, tape it to secure the contents. This way the sandwich is packed and eaten without any mess. Hence, sandwich is a very delicate food item and so needs to be treated gently. 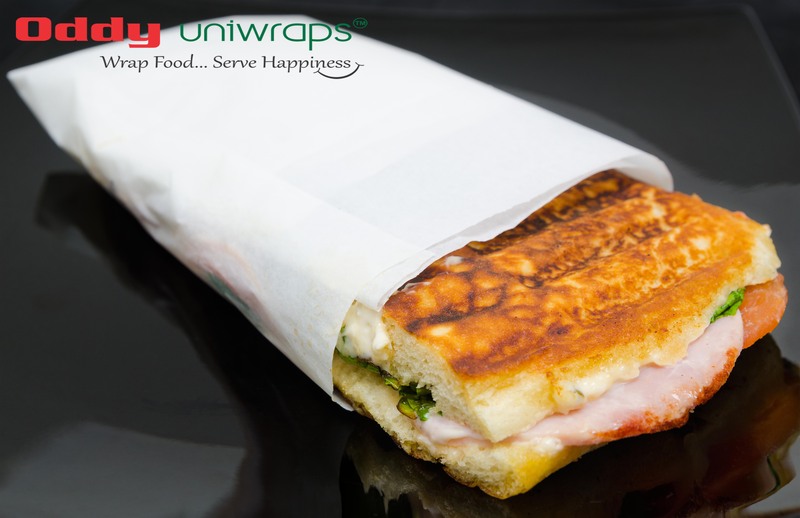 To enjoy a fresh and relishing sandwich on the go, make sure it is wrapped nicely and in the right way. Parchment paper is a great choice to keep the sandwich tightly together. To have a safe and successful packaging, the choice of sandwich should be right. If you do not like your sandwich to be soggy, choose rolls or crusty bread. For sandwich slice toast the bread to make it moisture free. Spread the condiments, tomatoes or juicy products in the middle or center of the sandwich. If you want the sandwich ahead of time then place the lettuce between the bread and salad. So, next time when you have to eat a sandwich on the go you can be assured of getting a fresh, healthy and tasty sandwich which is no more messy or soggy. Parchment sheet will keep your sandwich in a perfect shape and make it look tempting to eat.